There’s nothing quite like honey. For centuries, entire civilizations have turned to this natural wonder for its signature sweetness and its abounding nourishing benefits. Blume Honey Water harnesses the power of honey in our hydrating, energizing waters, and only 100% bee-friendly honey will do. We know your standards are just as high as ours. Honey supplies two stages of energy. 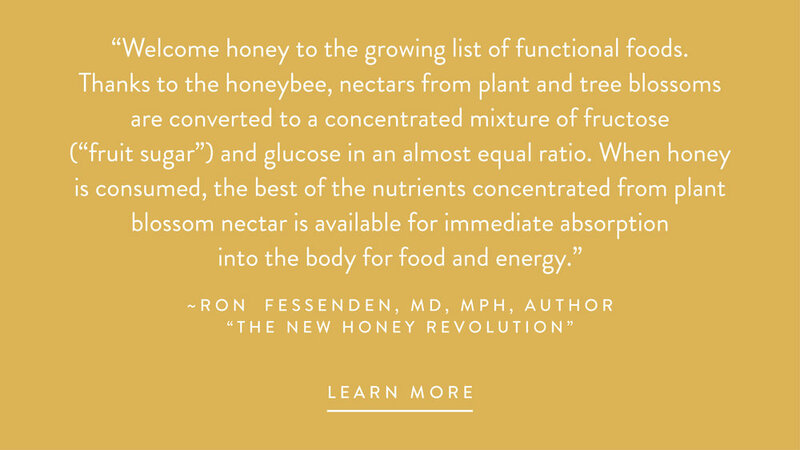 First, your body absorbs honey’s glucose for immediate invigoration and then the slow-absorbing fructose provides smooth, sustained energy. Honey Vs Sugar: What's the difference? Both sweeteners contain glucose and fructose. However, during the manufacturing of sugar, the organic acids, protein, nitrogen elements, enzymes and vitamins in the sugar cane are destroyed, whereas honey, a natural sweetener, subjected only to minimal heating maintains all of the beneficial properties. Honey has certain beneficial antioxidant and antimicrobial properties which are not present in table sugar. 1. A lesser amount of honey is required for sweetening than processed sugar. 2. Honey is slowly absorbed into the bloodstream. 3. Honey has nutrients whereas processed sugar has none. Spring Honey is the lightest in color and thinnest in consistency. It is often the most flavorful and has very distinctive floral notes. Summer Honey is more amber in color and has a medium consistency. The taste is often richer and can be slightly acidic, while still floral in nose. Fall honey can range from dark amber to molasses color with a thick consistency. The taste can be as strong as molasses and even burnt marshmallow. There are thousands of honey varietals found around the world (more than 350 in the U.S. alone), and each has its own distinctive floral character. We craft a proprietary honey blend not only to avoid single sourcing, but more so to take advantage of the beautifully diverse flavors and aromas that various honeys bestow on our waters. Steve is the owner of Meadow Sweet Apiaries and a second-generation beekeeper living in Pittsburgh, PA. He is a certified Master Beekeeper through the Eastern Apicultural Society and is also the current President of the Pennsylvania State Beekeepers Association, president of Burgh Bees, and a member of the Board of Directors for the American Beekeeping Federation. He is also an active member of the PA Queen Improvement Projectand is a member of the Penn State Center for Pollinator Research Advisory Board and the Pennsylvania State Apiary Advisory Board. Stephen manages 100 colonies and is involved in honey production, queen rearing and the selling of nucleus hives each summer to those interested in starting or expanding their own beekeeping adventure! Steve can be found teaching beekeeping classes and workshops and presenting lectures at regional and national conferences around the United States. beekeeping and honey and the future of each. In his own words: "The skills of a beekeeper are paramount in contributing to the health of the bees and their capacity to produce quality excess honey. Helping bees to maintain strong immune systems demands skill and constant learning. Diverse food supports bee health. We have a labor-intensive practice of moving our hives several times a year, following nectar flows. We do this to help support the nutritional needs of the bees and because this diversity of foods helps create the rich complex flavors of our honey. When our honey is jarred for consumption, it is a fully blended honey with diverse nectars from the varying eco-zones solely from Boulder County. The floral source for this truly local honey comes in part directly from your backyard." Try one of his amazing honey herbal blends! environmental health and pure food. Among Alan's goals are: " To do the best job possible in caring for the bees and their environment. Animal husbandry is a 24/7 occupation and an enormous responsibility. Make no mistake, if it weren't for the beekeeper hovering over his hives, most of them would perish within a relatively short period. That is particularly true these days with two parasitic mites to deal with, plus antibiotic resistant foulbrood diseases, hungry bears, and the changing environment. We take pride in consistently producing the finest, most natural products we can harvest from the bees." Tremblay Apiaries are major participants and supporters of the Council for the Environment, the Greenmarkets, of NYC. They are proud to be retailing their products to the people of New York City. AND, they have some of the best bee pollen we've ever tasted!